When you find yourself with an abundance of supplies for the yard, or a lot of the seasonal items that for 11 months of the year just take up space, then a storage shed is the answer. 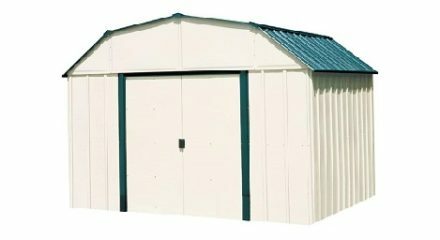 The Vinyl Sheridan storage shed is the solution you need, with an exterior finish of a durable vinyl coating. Pick the one that meets your needs. The steel walls are made of a durable, galvanized material, for a lasting capability. So to solve your storage needs, the Vinyl Sheridan is the choice to make.